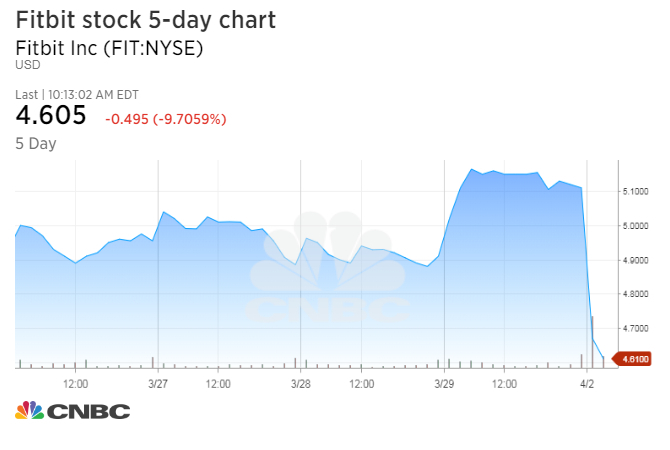 Shares of the athletic watchmaker dropped more than 9 percent shortly, adding to a 30 percent decline over the past six months. Morgan Stanley goes to underweight from equalweight. In justifying the analyst’s new underweight rating, Anderson said the recent pace of software and sensor development has not had a pronounced effect on demand. The analyst’s new 12-month price target of $4 (down from $5) implies downside of 21 percent for shares of Fitbit. The company sold 15.3 million devices in 2017, a far cry from the 22.3 million sold in 2016. The company’s sluggish sales come as Apple’s new cellular smartwatch greater emphasis on healthhave boosted its own wearable business.